Pancake Day is coming, and it’s time to get flipping! It’s a great time of year to get the kids involved in the kitchen as pancakes are fairly quick and easy to make (even if it does get a bit messy!). And once the pancakes are done, the kids can add whatever toppings they want – guaranteeing to keep everyone happy. Pancake Day, or Shrove Tuesday, is the day before Lent, which is traditionally a period of fasting and clearing out your cupboards of things such as sugar and butter. Pancakes are a quick and easy way of using up these ingredients, which is why this Tuesday has now become known as Pancake Day. This year, Pancake Day takes place on February 13th, but why wait until then? Pancakes provide delicious breakfasts, desserts or even main meals. 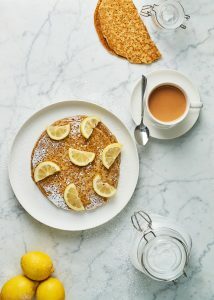 We love them so much, we’ve concentrated all our efforts to find the best pancake recipe, and we think we’ve cracked it. Not only delicious, this is an easy pancake recipe the kids can have fun getting involved with as well. 1. Sift the flour into your mixing bowl, making sure to keep the sieve quite high above the bowl so the flour gets a good airing (although not so high it goes all over the kitchen, especially if little ones are involved!). Add the salt. 2. Break your eggs into a cup or bowl. Make a ‘well’ in the centre of the flour and pour the eggs into it. 3. Give the mixture a good whisk, using a spatula to make sure you get all the flour from the edges of the bowl. 4. Slowly start to add the milk, a bit at a time, whisking all the while. Keep adding the milk and whisking until the mixture is smooth and has reached the consistency of single cream. 5. Melt the butter in a non-stick frying pan (or try a very low heat in the microwave) and then spoon 2 tablespoons into your pancake mixture. Put the rest aside – you’ll need this to grease the pan before each pancake. 6. Leave the mixture to sit for about 30 minutes. 7. Using a small amount of the melted butter, grease your frying pan. Make sure the pan is hot and then add 2 tablespoons of the pancake mixture. 8. As soon as the mixture touches the pan, tip the pan from side to side so that the batter completely covers the base of the pan. 9. Once the edges of your pancake start to look dry and bubbles start to form, carefully lift the edge of the pancake. If you can see it’s starting to look golden underneath, then flip it and cook the other side. 10. Once the pancake is golden on both sides and cooked through, it’s ready to eat! Making American pancakes is easier than you think and will give you gorgeously fluffy pancakes. Just take our recipe above and add in 1tsp of baking powder and 2bsp of caster sugar. Wondering how to make blueberry pancakes? Simply chuck a few into your pancake mix and fry as normal. Easy peasy and extremely delicious – serve with maple syrup for that authentic American diner finish. Then, all you’ve got to do is decide what to put on top. We don’t think you can beat classic lemon and sugar, but for a really tasty (and naughty!) treat, melted chocolate or Nutella come a close second. 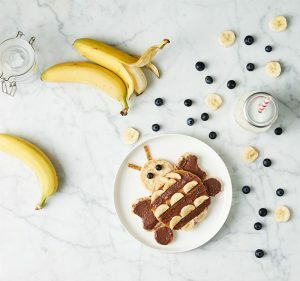 For a healthy option that kids will love – use fruit with your pancakes to create fun shapes. We’ve gone for a bumble bee but the options (and flavours) are endless. Don’t overmix your pancake batter. If you do, you’ll develop the gluten which will make for tough pancakes. Resting the pancake batter in the fridge for 30 minutes before cooking will give you lighter pancakes. Use a ladle to measure out the batter into the pan for evenly-sized pancakes. You can freeze cooked pancakes. Once cooled, layer them flat with sheets of greaseproof paper in between. Then just slide the stack into a freezer bag and pop in the freezer. To use, thaw in the fridge, then reheat in a frying pan, making sure they’re piping hot. Do you have a favourite pancake mix recipe loved by your family and friends? What’s your favourite pancake topping? Share your ideas with us via our Twitter, Facebook or Instagram page.